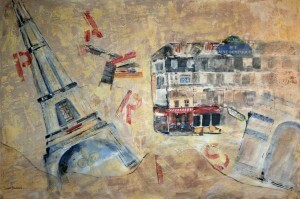 "PARIS" by Susie Stockholm, collage and acrylic on canvas, 40" x 60"
For Mother’s Day this year I was taken to Paris by my children. We visited the Arc de Triomphe, the Eiffel Tower, had coffee outside Cafe Constant, and sipped wine along with way. The second floor apartment’s balcony which faced the Eiffel Tower was the site of many, many photographs. These photographs are how I was transported to Paris. My daughter explained that Paris is built like a wheel and that the buildings fan out from the center, like spokes. I was told that there is a law that buildings must be a certain exterior color combination: Dark gray on the top floor, white next and tan on the bottom two floors; they cannot exceed 4 stories – it may be three. My eldest grandson became enamored of the gorgeous Basilique du Sacre Coeur de Montmartre (Basilica of the Sacred Heart). My son-in-law loved the street and address signs, and my daughter fell in love with Rodin’s “The Thinker.” The youngest grandson loved playing in the parks. Inspired by their last summer’s Paris trip, we decided to collage and paint a 40” x 60” remembrance on canvas for their dining room. Since I was only there for 4 days, I asked for and got a lot of help and input. Doing a big commissioned painting in a weekend offered up some challenges: What should be included? Did they want to participate in the painting or just give me the photos and data? Could I make them happy? Could I make a good painting in so short a time? How would I manage without my normal tools and brushes? Would we need more than two trips to Jerry’s Artarama? My biggest curiosity was whether I would finish before my plane left on Wednesday morning. We had other fun things going on like a band concert, a football game, Mother’s Day dinner and my birthday lunch, along with breakfast at a favorite diner and an art walk down the town’s main street. I’m sure I’ve left something out. Oh, yeah, a really hilarious adventure at P.F. Chang’s involving my youngest grandson. It was a very busy time. One of the great by-products of a family project is the creative spin-off. Here’s grandson #2 with his whimsical origami “Toads” collage. He’s amazing with his hands and has such a great sense of design, too. Having a shared purpose provided a wonderful camaraderie and fascinating conversation, too. We had something going on that we all cared about. Plus, I got to hear more details of their Eiffel Tower visit. Apparently there was a break in the rain storm, and in the crowd, so they were able to enjoy themselves without the crush of people. The Louvre was another story altogether, and the guards were ever vigilant for someone freaking out from claustrophobia. These tidbits aren’t passed on when you live several hundred miles apart with everyone leading busy lives. You can see that I did indeed finish, sans any contemplation time. The kids seemed thrilled, and the painting hangs on their red dining room wall. I’m happy, too. They have a lot of paint and tools now for making their own art. Somebody, please give them a canvas for their anniversary! This entry was posted in Kids, Paintings, Prints and Collages on June 1, 2012 by susie. Wow you did it!!! Great blog and great painting and what a great kitchen to paint in!!! You work nicely with a deadline! Love it! Painting simple and beautiful. I’d love to have a Stockholm or two hanging here in San Diego. (Maybe a local theme to it?) It’d be a nice finishing touch to the new home.